Labor Day weekend is upon us, which unfortunately is a very real indicator that summer is officially over. The good news is that Labor Day weekend also means a three day weekend for many, who doesn’t love a three day weekend? While making plans for your extra day off, we suggest you take advantage of the last stretch of nice weather and host an outdoor barbecue or picnic. To make party planning as easy as can be, we have picked a few parties to help inspire a fabulous Labor Day event. A barbecue is always a good party choice when you want to entertain outdoors and that is certainly true of this backyard BBQ from Celebrations at Home which would make a wonderful Labor Day party. This barbecue has a great vintage feel with a red, white and blue color palette. Recycled cans, decorated with country style napkins make great vases to hold bright, colorful flowers. Custom printables from Paper & Pigtails are used as menu place cards and jar labels for condiments and smaller menu items. Themed printables and clever ideas (like using canning jars for drinks and side food items) is a cute way to add more flair to any party décor. They also make for amazing party pictures! 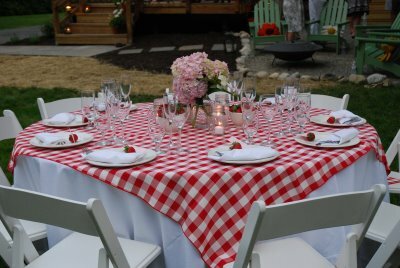 This Labor Day picnic party featured on Event Trender uses gingham (everyone’s favorite picnic pattern) to set the stage for a beautiful tablescape. 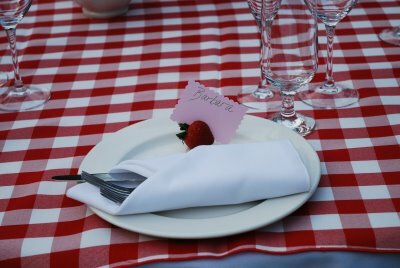 The red and white gingham tablecloth is accompanied by bold, red napkins at each place setting. 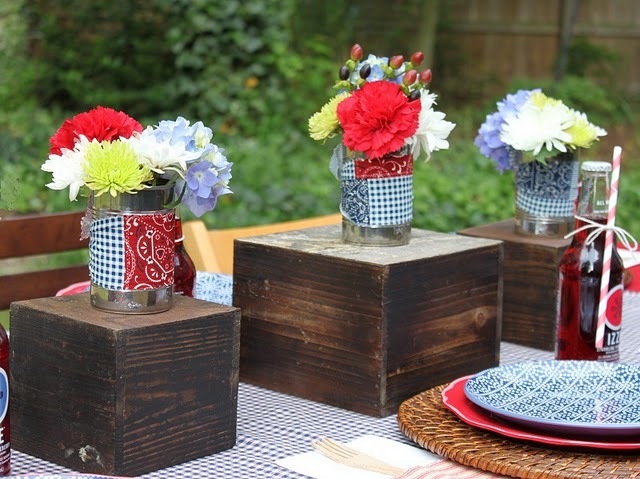 Tables are topped with gorgeous and vibrant fresh cut flowers with adorable mason jars used for vases. The fresh and creative menu items are listed on an adorably crafted apron shaped menu that really adds to the table display - a very nice touch! If you love the picnic idea, but want it to be a bit more formal, take a look at this strawberry themed picnic dinner party from The Princess and The Frog Blog. This picnic has more of a catered feel as each table is arranged reception style and food is carefully displayed at a buffet station. Lovely, pink hydrangeas and bowls of fresh strawberries are used as centerpieces. Guest place cards are held with fresh cut strawberries, how creative?! All guests were even sent home with jars of strawberry jam, what a wonderful way to carry a theme throughout the entire party. You can easily add entertainment to any of these outdoor events; hiring a live band or DJ will help ensure that there is no dull moment during the celebration. If you are planning on having children join in the fun, consider hiring a face painter or balloon twister to entertain and keep the little ones happy. Happy Labor Day! Are you inspired by our Labor Day party picks? Let us know your thoughts in the comments below.